Creeping Kate’s is located in the Castle’s former stables and named for one of the family’s most successful racehorses back in the day. The location for a fabulous Cumbrian breakfast for our Coachmans Quarters B&B guests, Creeping Kate’s opens to the visiting public daily in the main season serving a full range of options from light snacks to main meals plus delicious homemade cakes and a selection of hot and cold drinks; something for everyone! Last orders for meals may be earlier than closing time, which is generally 4pm, with cakes, snacks and drinks available until we close. Please check exact opening and serving times on the day to avoid disappointment as these may vary. Special diets (gluten-free, dairy-free etc) catered for BUT particularly at busy times we can advise you better and offer more options if we know you are coming so please feel free to contact us in advance of your visit. 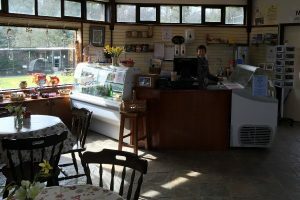 Situated at the entrance to the Hawk & Owl Centre and just off the coach and disabled customer car park, the Owl Garden Tearoom offers a selection of hot and cold drinks, snacks and cakes plus scooped icecream from Easter to October. In the winter period when the main café is closed it also offers homemade soup and a selection of sandwiches. It opens daily in the main season and at weekends in the winter period. 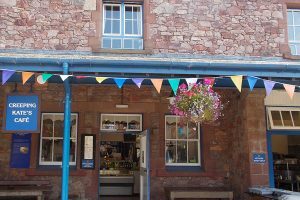 Customers with dogs are welcome to use the Owl Garden Tearoom. Depending on numbers, we can offer two different dining experiences for groups. 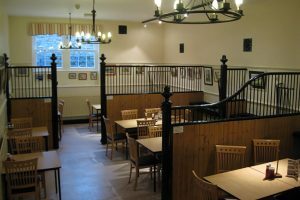 The Old Laundry function room can hold up to eighty people for either two or three course meals, a buffet lunch or soup and sandwiches. Alternatively, should you prefer the elegance of the Castle for lunch or afternoon tea, the Family Dining Room can hold up to forty-six people. Please email us for prices and further information. Pre-booking is essential for group catering. Friends get 10% discount in our cafés (excluding confectionery and icecream). Please present your membership card or temporary pass before placing your order to obtain your reduction.